Hard-hitting rock, heavy breakdowns, and an energetic live performance that never stops entertaining the crowd appropriately describes Zeb Christensen’s Omaha Nebraska-based band named Screaming For Silence. Over the last three years, they have toured nationally and played over four hundred live shows from coast to coast. With that, his band has continually captivated audiences across the nation, gaining new fans during each show at every stop. During Screaming For Silence’s hectic 2013 touring schedule, they were rewarded with a sponsorship opportunity promoting PRS’s new line of S2 guitars. In 2014, they spent the year touring and recording their first full-length studio album. Their new material was recorded in North Hollywood, California at Grey Area Studios with producer Erik Ron, who has also worked with Motionless In White, We Came As Romans, and New Year’s Day. 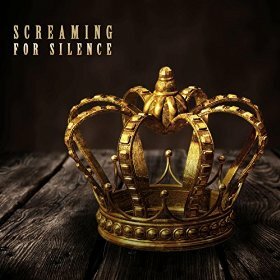 With head banging guitar riffs, intense drums, and melodic hooks containing in your face lyrics the members of Screaming For Silence have created their own unique sound. The first single off their self-titled debut is aptly named “The King Is Crowned” garnered radio play across the country and peaked at #29 on Billboard’s Indicator chart. In May of 2015, they were selected by Ernie Ball as the Battle of the Bands for Rock On The Range winners. Having the right combination of talent, work ethic, and road experience they are poised to explode onto the rock scene in 2016. In this edition of The Creative Spotlight, I had the pleasure of interviewing Zeb Christensen, the lead vocalist of Screaming For Silence, and asking him a few questions about his musical influences, his songwriting and recording process, his upcoming tour schedule, and his band’s new album Screaming For Silence. The Creative Spotlight: At what age did you first realize that you wanted to be a musician and whom or what would you say inspired you? Zeb Christensen: I have always been into music. I’ll never forget the first rock concert I went to which was an outdoor festival. The sun was out and the music was loud I loved it! After seeing all of the energy and emotion that the bands were giving I told myself I wanted to do that! I’ve been inspired by so many musicians. Corey Taylor, Johnny Cash, and Eminem. I like everything; if it catches my ear I dig it. TCS: For the benefit of those who are not familiar with Zeb Christensen or Screaming For Silence, how would you describe your musical genre? ZC: We are a five piece Hard Rock band from Omaha, NE. We have been touring nationally for about four years playing over 400 shows in that span. We released our first full length album in 2015 that is self-titled. ZC: Our musical influences are really all over the board and I think that really helped shape us as a band. We all are kind of into different genres and that gives us a little different flavor. TCS: Take us behind the scenes in the making of your self-titled full length album entitled Screaming For Silence. What was your favorite part of its production and the most challenging from an artistic perspective? ZC: The whole experience was amazing. Getting to work with the guys and Erik Ron on the album was such a blast. My favorite part is getting to hear all the songs come to life from nothing and then all the way to the final product. It’s something we are very proud of and put a lot work and emotion into. I would say the most challenging part of the process is picking which songs go onto the album! TCS: Personally, one of my favorite songs off of Screaming For Silence is the lead track called “The King Is Crowned,” so can you share with us the meaning behind it and the video concept? ZC: We knew after finishing the album that this was going to be the first single. It just had all of the elements. We wanted to make a killer video for it so we thought it would be cool to get our hometown of Omaha involved and film it at the Joslyn Castle. Aaron Gum and Tyler Yager really made this video come to life! We thought it was very fitting to film in a castle. There was a huge storm that day and our crowd still showed up in full force to be a part of it. We had a great response from it and got a lot of radio behind it. It ended up peaking at #29 on the Billboard Indicator Chart and #14 on the Under The Radar Chart. We really owe it to all of our fans that helped spread the word and would call and request! TCS: How thrilling was it to have “The King Is Crowned” selected as the winner of the 2016 NAIRMA Award for Outstanding Song? ZC: It was the one of my favorite moments as a band. Getting to be there in LA for the whole experience was just awesome. Rubbing elbows with people in bands we look up to and the whole environment was great. When they called our name we were in a little bit of shock I think haha. It just makes you feel like you are doing something right when someone gives you recognition. TCS: Can you describe for us the background to the 2012 hit single entitled “Helpless” that appeared on your debut EP Relentless? ZC: The song is about people who just can’t do anything for themselves. They are always throwing themselves a pity party and not doing anything to help the situation. People like that are really tough to deal with. ZC: We have always had the mind set of we will play anywhere at any time. It makes for a lot of interesting shows! In the end it has also made us who we are. We are so lucky to be able to play music and perform as much as we do! TCS: Is there a particular venue that you’ve always wanted to play? And, what other entertainer or entertainers would you most like to have play alongside you on that stage? ZC: The only area of the country we haven’t hit is the Northwest. I can’t wait to get up there. I’d also really like to play The Machine Shop in Flint, MI. I feel like that venue has one of the best reputations in the country. I’d love to tour with Ke$ha. TCS: Tell us about the Screaming For Silence song writing, recording, and video production process behind the song “Separate” which also appeared on the Relentless? ZC: We actually worked with Justin Mccain of the band Through Fire from Omaha NE. He’s an amazing artist/songwriter and we were really young. He wanted to do a song together and I think we ended up doing the whole thing in a day. We hadn’t really done much recording at that time so it was awesome to get the experience with him and learn a lot. TCS: In what ways do you market your appearances, sell merchandise, and stay connected to your fans? ZC: We have our own website Screamingforsilence.com and you can also find us on almost every social media outlet (Facebook/Instagram/Twitter/Snapchat etc.) Also all of our music is on iTunes, Spotify, Pandora, Amazon and more! ZC: I always try to plug bands that are up and coming like us. We just did a lot of touring with some bands that are killer like Guns Out At Sundown, Poynte, Sleep Signals. Also a lot of our good friends just released new music or are about to like Blameshift, 3 Pill Morning, and Another Lost Year. TCS: What does the short and long-term outlook look like for Screaming For Silence? ZC: This summer we are doing just mostly festival stuff. Rocklahoma, Rock Fest (Cadott,WI). I’m really looking forward to Locofest in Algona, IA and headlining a new festival in our hometown called The New Generation Music Festival. You can find all of those dates on our website. Then we are heading back to the studio in August to make a new album!